My son seems to have highly sensitive feet - he only wears these socks now - and has for the last few years. Although they are a lot more expensive - totally worth it for us. Takes the trouble out of him wearing shoes and socks. My ASD son (now 8 years old) has super sensitive feet. He would spend about 20 minutes every morning crying about his socks. They really bothered him. He would take his shoes and socks off at the first opportunity. He has been wearing these socks for several years and it’s are no longer an issue. They last really well and are worth every cent. He only wears these socks now. Really thrilled with my 2x pairs of socks. Very comfortable and great to have a choice in colours. Glad I founf you - the only business in Australia providing much needed socks! This is a good sock that does feel seamless and snug on the foot. The only problem is that the top of the sock around the ankle/leg rolls down slightly of its own accord and there's no way of getting it to stay up. Unfortunately, my Aspie child finds this very difficult to accept and refuses to wear the sock! I having tried on the sock myself, and the rolled top makes no difference to the feel of the sock, it's just an aesthetic thing. Otherwise, a good product. The seamless part of the socks work really well - only occasional short lasting tears now from my daughter when putting them on, as opposed to 20 minute tantrums to get her other socks on. Initially my daughter was upset that the top of the socks tend to roll down, however she's now used to having a choice of wearing them 'pulled up as much as possible' or 'rolled fully down to just above her ankle'.Haven't washed them yet and only had them a short time so can't comment about durability. We love these socks. My daughter and I both wear them. We've tried cheaper brands of seamless socks but always come back to these ones! The only problem now is that my daughter won't take them off - she wears them around the clock. Yes they're expensive but so worth it - the wear well also. My daughter won't wear any other socks so they've got the formula right for sensitive feet. Ordering more as needed. We go slightly smaller as she likes them to fit snug. REPLY from It Makes Sense: Thanks so much for your feedback, particularly about pricing. I'm conscious of this being a problem with my site that I'm trying to fix (it's a product of the way my shop was set up when I first started and wasn't yet registered for GST). Unfortunately it's a little more complex than I hoped but hopefully I'll have it sorted soon. Meanwhile, I do try to provide as much detail as possible by listing the price as ex-GST and also with details on my FAQ page. Thanks again. Love, love, love these socks!!! My son can’t stand the feel of seams in his socks. These eliminate the morning fight of putting socks on and helps us get out the door on time! 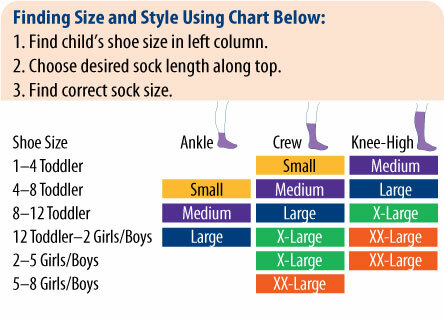 No more meltdowns over socks! Our grand daughter started school this year- she had to wear socks and shoes. There were problems every day as she cried and said the socks hurt. So I found these socks and we tried a pair. Our son, her Dad reports they are the only socks she will wear and they saved his sanity. We have now ordered more, we call them "Magic Socks".